Note: Adventure in Understanding is a HIP Approved Project. If you would like to support this, further details can be found under Approved Projects. We wish the group a safe journey and success! A canoe trip meant to connect First Nation and non-First Nation youths began its paddle up stream on Thursday. An Adventure in Understanding left Beavermead Park on Thursday morning after the kids, their guides and Curve Lake First Nation council members ate dinner and held their opening ceremonies in GreenUP Ecology Park the evening before. The adventure's goal is to connect youths from different cultures, giving them a chance to spend time together and get to know each other. Throughout their journey, the teens will meet with Elders and learn about First Nation traditions in the area by focusing on the land and what's around them. The group is traveling in a 26-foot Voyageur canoe, up the Otonabee River, with various stops and camping destinations along the way. After making the hour and a half trek from Beavermead to Trent University, the adventurists enjoyed bannock and stew around a fire in teepee. They then took part in a presentation by Trent Aboriginal Cultural Knowledge and Science that included a smudging, interactive games and a lesson on the importance of water and how to take care of it. The trip was initiated by the Rotary Club of Peterborough-Kawartha, partnered with Camp Kawartha and Curve Lake First Nation. In its inaugural year, Glen Caradus, trip co-ordinator, said the idea is for the adventure to grow in years to come. Diversity, cross-cultural understanding, team building, along with the benefits of being outside are what this adventure is all about, said Caradus. Accompanied by three guides, the group consists of three girls from Peterborough and one boy from Curve Lake, who are between 16 to18-years-old. Connor Williams, 17, said he heard about the trip while working at the Curve Lake First Nation Cultural Centre. "I thought it'd be a fun experience to finish off my summer before going back to school," Williams said. He said the trip is a fun way to meet people from other communities. "It's wonderful," he said, "the group of people I'm with are amazing." Visiting the Petroglyphs and wild rice beds, practicing traditional skills, such as archery, bow and drill fires starting, and learning about the medicines in nature are part of the adventure's agenda, along with teachings from elders. Over the next few days, the adventure will take the group up to Lakefield, upper and lower Buckhorn, Lovesick Lake, Burleigh Falls and finally to Curve Lake on Monday where they will enjoy a feast and a closing ceremony. Throughout their journey, the group is carrying a tree from the GreenUp Ecology Park, which they plan to plant during the ceremony at Curve Lake. Article courtesy The Barrie Examiner on the Rama First Nations Pow Wow. Read the "tweets" and you will see "Four Directions" mentioned - one of the links on our HIP website. TORONTO - Sensitive testimony from survivors of Canada's notorious residential school system should be kept for 15 years then destroyed, an Ontario court has ruled. In a decision released Thursday, Superior Court Justice Paul Perell said the time should be used to see whether those involved might agree to have their records transferred to a new national archive. "During the 15-year retention period, there shall be a court-approved program to advise the survivors of their choice to transfer some of the documents instead of having (them) destroyed," Perell wrote. The justice said that destroying the documents is necessary to protect the confidentiality and privacy of the information, and to safeguard the assessment process itself. If survivors want their records kept, the material will have to be redacted to protect perpetrators or other third parties. The documents in question relate to compensation claims made by as many as 30,000 survivors of the Indian residential schools under an agreement that settled a class-action suit against the federal government. Many of the records contain heart-rending and emotional accounts of sexual, physical and psychological abuse. The head of the compensation assessment process, backed by a privacy expert, argued the material was intended to be confidential and should be destroyed once the claims are processed. Others, such as the Truth and Reconciliation Commission or TRC, called for the documents to be preserved to ensure as complete a historical record as possible. In an interview, Julian Falconer, lawyer for the commission, expressed cautious optimism but said much will depend on the process to educate claimants about their choices. "The TRC has maintained from the outset that it was of crucial importance that claimants have a choice, that they have an opportunity to exercise informed consent about the fate of their records," Falconer said. "The (commission) remains committed to protecting history." Perell said the court would work out details of the notice to claimants at another hearing. The head of the adjudication process, Dan Shapiro, said in a statement he was pleased with the decision. "The court has issued a clear statement confirming the privacy of claimants and others identified in compensation claim records," Shapiro said. "This will be a huge relief to the thousands of claimants who have appeared at our hearings fully expecting that their accounts of the abuse they suffered at Indian residential schools would not be made public without their consent." About 150,000 First Nations, Inuit and Metis children were forced to attend residential schools over much of the last century as part of government efforts to "take the Indian out of the child.'' Many suffered horrific abuse at the church-run schools. Materials collected by the Truth and Reconciliation Commission, which also heard from thousands of survivors, are to be housed at the new National Research Centre at the University of Manitoba. Ry Moran, head of the archive, fretted that the voices of thousands of survivors would forever be silenced if their testimony was destroyed. But Perell found that if personal information from the assessment process was released — even by mistake — it would be a "grievous betrayal of trust" that would "foster enmity and new harms." Destroying them, he said, is what the parties agreed to and would more likely foster reconciliation. OTTAWA - Controversial changes to aboriginal education will be up for debate today in Halifax at the annual meeting of the Assembly of First Nations. Chiefs from across Canada must decide what to do now that they've rejected the Conservative government's bill to reform First Nations education. The legislation deeply divided the aboriginal community and precipitated the abrupt departure of Shawn Atleo as national chief of the AFN. Some saw it as a first step — with a substantial dollar amount attached — that could improve the lives of First Nations children. 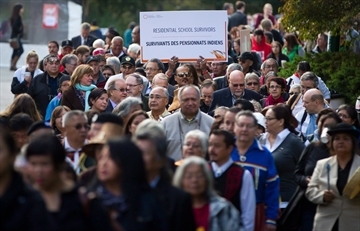 Others viewed it as the government exerting too much control over aboriginal education. Jaime Battiste, the AFN's interim regional chief for Nova Scotia and Newfoundland, says many chiefs aren't dead-set against the bill and are open to compromise. "I heard a lot of chiefs saying that they don't want to throw the baby out with the bath water, that there's room for discussion," he said in an interview. "I think the chiefs are looking for a commitment on equitable funding from the government, and they're willing to work with the government to ensure that they're happy that their money will be spent in an accountable manner. "However, I think that the chiefs aren't willing to create a bureaucracy in Ottawa for our education. I think that each region, each nation, has their own people that they would rather have working on that than a bigger bureaucracy out of Ottawa." The Conservatives say their bill will remain on hold and no new money will be spent until the AFN gets behind the legislation. Regional chiefs briefly showed their support for the education bill by attending an event in February with Prime Minister Stephen Harper and Atleo, but that support quickly evaporated. Whether $1.9 billion tied to the original bill is gone, too, is another question. A spokeswoman for Aboriginal Affairs Minister Bernard Valcourt would only repeat a talking point from earlier this year when asked if the money is still on the table. "Our government is extremely disappointed that the Assembly of First Nations (AFN) did not honour its agreement with the government,'' said an emailed statement attributed to Valcourt spokeswoman Andrea Richer. "As we have said all along, this legislation will not proceed without the support of AFN, and we have been clear that we will not invest new money in an education system that does not serve the best interests of First Nations children; funding will only follow real education reforms." Chiefs from across Canada voted in May to reject the Conservative education reforms, and they demanded a new agreement with First Nations that provides transfer payments to aboriginal communities. They also want the government to provide $1.9 billion tied to the original bill immediately, with a 4.5 per cent escalator until a new deal on education is reached. Valcourt says too much time and effort has gone into the bill to start over again. The minister says the bill meets the five conditions outlined by the AFN and chiefs during a meeting in December. The legislation remains on hold as the government considers its options. Justin Trudeau, to see if he's really a government in waiting."